Let me preface this post with a thank you to Milburn Drysdale at ASDFunding.com. His documentation is what we based most of this work on, and if anyone asks you, they should check out his site before you read anything over here about Registered Disability Savings Plans for Disability Tax Credits. I’d also like to thank my wife who has fact checked my statements. 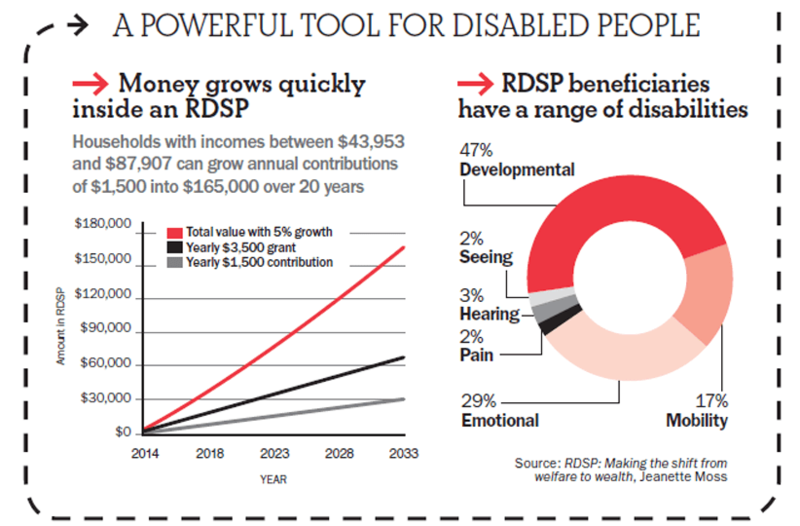 Is it time to re-apply for the disability tax credit ? As I have mentioned my son’s disability was “verified” by the CRA in 2009. At the time it was a “conditional” verification, and the CRA said that he would need to re-apply for the disability tax credit in 10 years (i.e. back dated to 2005). A few months ago, we received a child disability benefit notice from the CRA saying, the DTCC (Disability Tax Credit Certificate) would “expire” in December 2015 . I hadn’t thought about the fact that my son’s disability was viewed as a disability from birth, so the CRA credited me back taxes from when he was born. This meant that his disability tax credit period started from birth. Given my son has turned ten this year, it is logical that the CRA is now asking for a reassessment. The first steps towards re-applying for the DTC for my son was to go see our pediatrician and have him fill out the T2201 Disability Tax Credit Certificate. Our pediatrician could have turned us down and said, “No I won’t fill in the forms for you because in my opinion your son is no longer disabled”. This, however, was not the case. We then added to this documentation, a report from my son’s Occupational Therapist and a Speech Pathologist (Effect of Impairment Document), to help reaffirm my son’s disability diagnosis for the reapplication. It is better to have plenty of supporting documents for the application. No more tax deduction associated with my sons disability line 318 on my tax return. I would be unable to claim my son’s school and Occupational Therapy as a Medical Expense (any longer). Collapsing my son’s RDSP, which would entail paying back the CDSG and the CDSB that might have accumulated in that account. The child disability part of the Child Care Benefit will stop as well. The advice we got from our pediatrician is you can never have too much documentation. I think I view our pediatrician as a subject matter expert, as he has done many of these. You must make sure the information is easy to follow for the CRA folks that will be making the decision. The goal is to have a well written clear application. There is a list of qualified practitioners on the forms (T2201). This information is on the forms. Supporting documentation can be from other professionals, but you need a specific professional to sign the forms. The signed forms were sent via registered mail and we must now wait to see whether the Disability Tax Credit will continue for us. My grandson has been approve for the Disability tax credit (Autisim), my daughter has applied for retroactive 2006 to current year CCTB and Disability Tax Credit, should she also apply for the Family caregiver amount? She is the sole provider for my Grandson. We just went through the DTC process with our son, who has Down Syndrome. We learned that CRA has an RN on staff whose job it is to liaise with MDs or other professionals who might have questions about the DTC application process. We found out that a diagnosis of Trisomy 21 (Down Syndrome) automatically qualifies the child for the DTC from birth, but the CRA doesn’t advertise that fact. In our case, I asked that the RN at CRA call our neo-natologist who was completing the T2201, and all was clarified. It was a learning experience for all involved. Wow, that is a very useful piece of information, thank you for passing that on. For those still looking at doing their T2201, have your MD contact the CRA’s RN. Still no book on all this from you eh? You know there’s a lot of people who need your expertise compiled in a concise format. Gail Vaz Oxlade’s site has an article on the subject with over 1600 comments – mostly people asking what to do. My most commented articles are on that subject. Maybe when (or if) I retire I will compile it into an E-Book or something, anything can happen…. Thanks for the referrals. Hope all goes well (as I’m sure it will). Your point about having a clearly written document will go a long way with CRA. Hope we are helping some folks MD, lots of folks keep asking me questions, I keep pointing them at you. Sorry to hear about the headache but I’m optimistic things will work out. If you have enough documentation, and the right documentation, I don’t see why it wouldn’t. It should be fine, just another interesting headache, I hope.